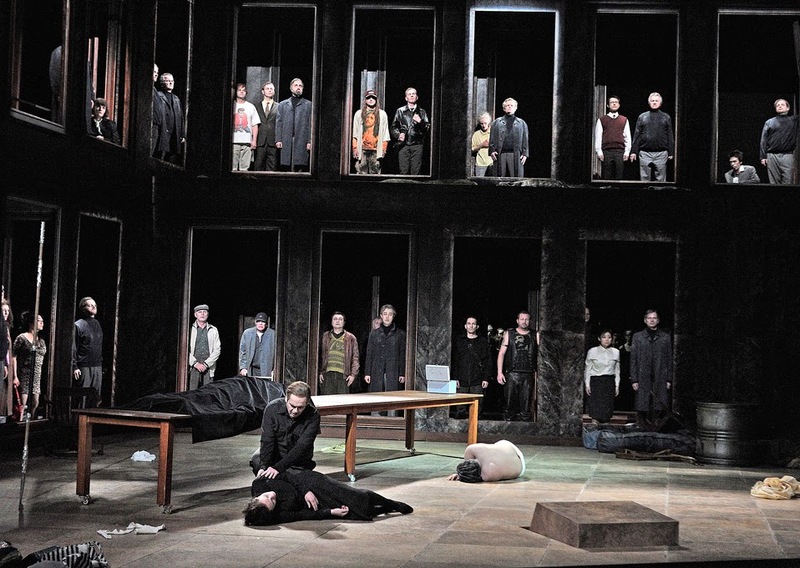 In a glowing review in the Guardian Andrew Clements describes the Freiburg Opera's Parsifal at the Norwich Theatre Royal - see production shot above - as "a show that almost any British company would be happy to have in its repertory". 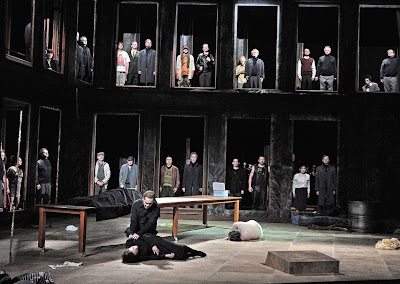 Yet despite the production's obvious quality, the four performances by the Freiburg company of Parsifal and Tannhäuser attracted lamentably small audiences. A London based critic blamed low profile promotion by the Norwich theatre for the poor attendance, and given the limited budget of the provincial venue, which has charitable status and no material public funding, there is some truth in that explanation. But the glib analysis of poor publicity is typical of the blame culture that is so prevalent in classical music today - blame elitism, funding cuts, antiquated concert conventions, piracy, in fact blame anything other than the self-harming behaviour of the music industry itself. All the fashionable conspiracy theories miss the obvious point that there is simply too much classical music available. We live in an age of Martini Wagner, where the master of Bayreuth's music is available any time, any place, anywhere. During the 2013 Wagner anniversary year there was a global glut of live performances of his music dramas and a deluge of re-releases of CDs and videos. As a result of this oversupply a musically acceptable complete Ring from Badische Staatskapelle on 14 CDs is currently available from Amazon UK for £11.38. If it is Parsifal you want, Barenboim's acclaimed interpretation is yours on 4 CDs for just £8.45; which is, of course, considerably less than the cheapest seat for the Norwich Parsifal. This glut of classical music on legacy recorded formats is matched by a torrent of free streamed content: with the promise that BBC Arts Online "will be offering deeper, richer engagement online with a wealth of new material, streaming performances and events, live and on-demand at some of the best events across the country", while Amazon Prime offers unlimited instant streaming of opera videos. So is it surprising that people will not travel from Cambridge (63 miles) to Norwich to hear Parsifal, yet alone from London (115 miles)? And what chance in a time of oversupply does a Parsifal that Andrew Clements astutely identifies as "a company achievement, without stars, of the kind we rarely get to hear in Britain" stand without a Kaufmann, Baremboim or Pappano to give it celebrity credibility? Music demands more from a listener than simply the possession of a tape-machine or a transistor radio. It demands some preparation, some effort, a journey to a special place, saving up for a ticket, some homework on the programme perhaps, some clarification of the ears and sharpening of the instincts. Classical music is one of the glories of our civilisation, but it is not exempt from the fundamental law of economics which states that when supply of a commodity outstrips demand the value - both real and perceived - falls. Forget the conspiracy theories, and forget the canard that growth is always good. Indisputable data shows that audiences for classical music are shrinking, yet, equally indisputably, the supply of music is increasing exponentially. You do not have to be a so-called industry expert to see that this is a disaster waiting to happen. A combination of new digital distribution technologies and avaricious media corporations has produced a perfect storm in which an oversupply is driving down the value of classical music to an all time low. Without value an art form has no future; so when will the classical music industry wake up and start tackling the problem of oversupply? And when will it finally confront the dead moose in the room - the considerable overcapacity in both the recorded and live music supply chains? "Heard William Christie with Les Arts Florrisants at the Proms last night performing Rameau - totally stunning but it has been demoted to a late night prom to make way for more mainstream programmes that will draw a crowd. Hardly anyone there and it made me very sad, despite the fact it had some of the richest artistic interpretation of any Prom." So it is not just the Theatre Royal Norwich that is experiencing lamentable attendances for classical music events. Really interesting article. Poor marketing is a blanket criticism which is as naive as it is unfair, taking no account of the wider picture (which this article ably outlines) but also the fact that many arts and music organisations are now seriously under-funded and marketing spend often takes an unrealistic 'hit' when budgets for major productions are set. "Music demands more from a listener than simply the possession of a tape-machine or a transistor radio. It demands some preparation, some effort, a journey to a special place, saving up for a ticket, some homework on the programme perhaps, some clarification of the ears and sharpening of the instincts." I understand the point Britten is making, but he sets up a false dichotomy between a live performance and a recorded performance. I'm sure that there are many who listen to a recorded performance in the way Britten decries, but I'm equally sure that there are many who are down toward the other end of the spectrum. A relatively recent personal example is the Rattle/Sellars "ritualisation" of the St. Matthew Passion. I'd read a reasonable amount about it beforehand, including a longish interview with Sellars; and got much more out of the DVD as a result. I then read some more, watched the DVD again a couple of weeks later, and enjoyed it even more. This is but one example where technology has enabled an easily accessible broader and deeper experience. Did I miss something by not seeing the performance live? Undoubtedly, but I've seen a couple of other live performances as some compensation. In other words, a recorded performance certainly need not be a couch potato experience. There are certainly advantages to seeing a live performance, but it shouldn't be set up as some sort of holy grail. In terms of the experience of recorded performance, the world of "classical" is far superior today to anything I've experienced in the 40+ years I've been listening.